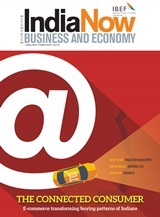 IBEF presents an enriched, enhanced 'India Now' magazine with more features, analysis and wider coverage. The cover story of the January-February issue talks about how the rising demand and consumption patterns of consumers in both urban and rural areas has drastically changed since the introduction of E-commerce. e-commerce and m-commerce in the country, global firms are viewing India as a favorable destination to partner with Indian companies to bring in international expertise, products and services. A fifth-generation business that found India a pride of place in the global textile market, Arvind Limited has over the years woven itself into a sprawling conglomerate. In leveraging opportunities, proactively recalibrating strategies, and balancing objectives, they exude the resilience of a perfect blend—one that lends them the confidence to double their textile business to Rs 12,000 crore (US$ 1.69 billion) in a span of five years from now. With 974 km of coastline and acres of land demarcated for aquaculture, Andhra Pradesh is the highest contributor to India’s marine product exports. Government initiatives have set the state on course to soon become the aquaculture hub of the world. From depending on imported tractors to becoming a major international player within six decades, the story of the evolution of the Indian tractor industry has been a phenomenal one. The evolution of the Indian tractor industry has been due to the need of the agricultural sector. Zomato, an Indian start-up is in the business of online food ordering. It was initially launched as Foodiebay.com in Gurugram in 2008, a website that scanned menus and provided ratings and recommendations on restaurants. It soon expanded to cities like Kolkata, Mumbai, Pune and Bengaluru and renamed itself as Zomato in 2010. The word ‘Pashmina’ is derived from the Persian word pashm meaning wool and in Kashmiri language, the term Pashmina is literally ‘soft gold’. Even today, the Pashmina sets its own benchmarks in sophistication and grandeur and is an aspirational product across the world Pashmina is finding prominence in fashion shows—in India and abroad—as a lightweight, luxury accessory that can be draped in different ways. Ooty, a hill station in southern India with an artificial Lake and vintage trains, was discovered accidentally in 1818 by Mr John Sullivan. An oak tree planted by Mr Sullivan about 150 years ago called Sullivan’s Oak still stands to this day. The artificial lake along with the boat houses have become a major tourist attraction.